Welcome to the 176th week of Travel Photo Thursday. This week on the ROK, we’ve celebrated Children’s Day and Buddha’s Birthday. Now I’m “recovering” from all that down time and trying to answer the multitude of emails that always seem to flow in after an extra long weekend. Work can wait! 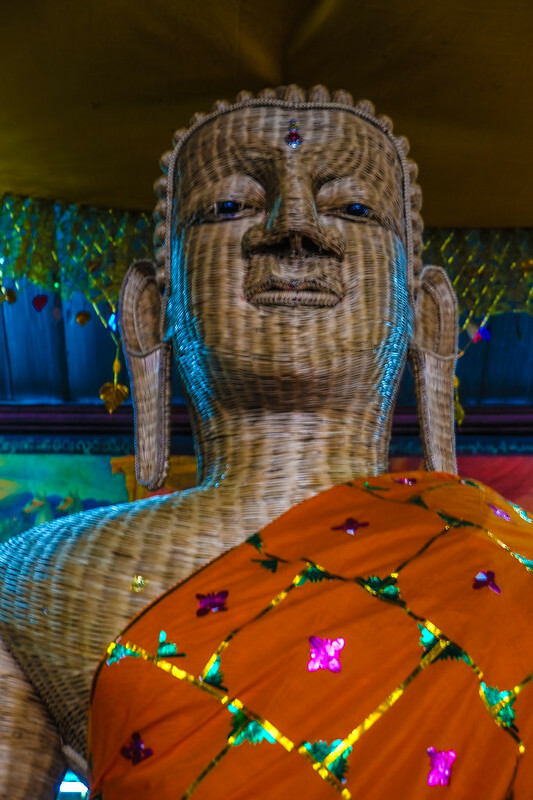 Today I want to introduce you to a one of a kind Buddah that find its home in the tiny, picturesque town of Mae Hong Song in the northern most corner of Thailand. To join in the Travel Photo Thursday fun simply post a photo on your blog. The Twitter hashtag for Travel Photo Thursday is #TPThursday. As a courtesy, please post a link to Budget Travelers Sandbox. 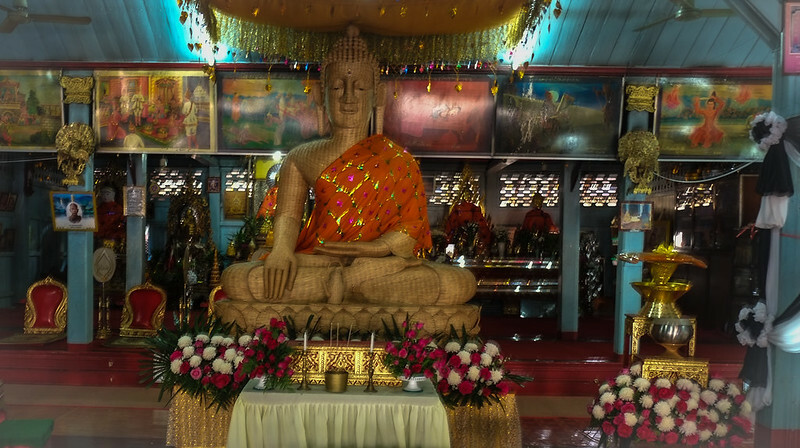 The folks of Mae Hong Song are very proud of this beautiful Buddah. 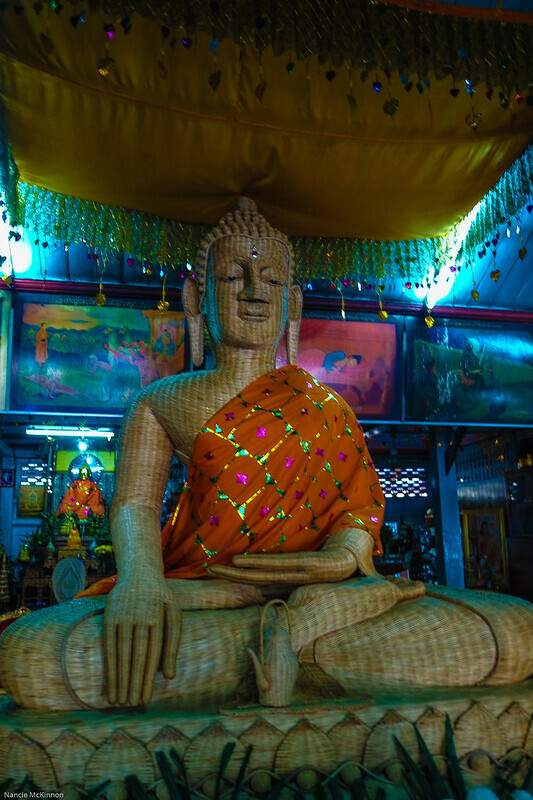 Lovenly woven by a local lady, townspeople believe the statue to be the only Buddah produced from 100% bamboo. At 10 feet tall, and 5 feet wide, this was definitely a major undertaking. I was amazed at the great attention to detail – a labor of love! I wonder how it took to weave those fingers?! Travelers Tip You’ll find the bamboo Buddha at Wat Chong Khan located in the center of town on the shore of Jong Cham Lake. The Wat is open everyday from sunrise to sunset. This is the 176th edition of Travel Photo Thursday. You can browse the archives here. Wow – I’m not surprised they’re proud of it! 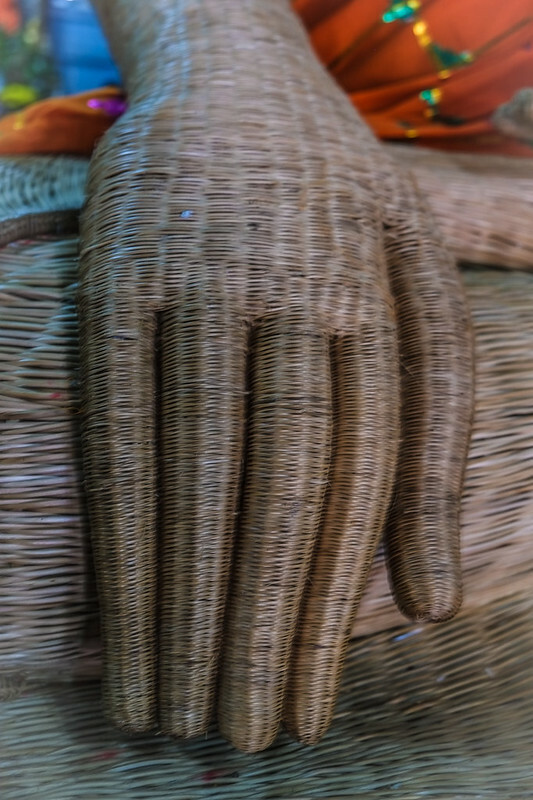 It’s amazing, and the details is stunning – I Iove the photo of the hand, where you can see how the bamboo has been woven together. Hi Molly! Agree, the work is amazing and something to be proud of! The lady who wove this Buddha is a true artisan. The detail is incredible. She must be very proud of her work and the fact that the village appreciates her efforts. It is unique. Hi Jan! It is definitely something to be proud of. I had no idea it was there until I arrived at the temple. It was a pleasant surprise. Reading about this Buddha that’s woven from bamboo, I realize I’ve taken for granted how versatile and pliable it is. Not to be impolite or disrespectful, but at 10 feet tall and 5 feet wide this Buddha is huge, much bigger that she is (or was) I’m sure. I know bamboo is light, but I wonder how heavy it turned out to be, how many people she had to have lift it and how long it took to complete. I wonder who she was…quite a labor of love and devotion. Thanks for sharing this, Nancie. I’ll be thinking about it all day. Hi Marcia…You make some great observations. I never thought of how heavy it must be. You’re right, she would have had to have a lot of help lift it. Rather an impressive talent this woman has – and a great deal of patience. I have so much respect for skilled crafts people. Hi Leigh…I’m with you. I can barely sew on a button! What an amazing undertaking to create this beautiful work of reverance. Hi Jill! Isn’t it, though? I don’t think I’d have the patience, even if I had the talent! What amazing artistry and like others who’ve commented, I love that hand photo. What a beautiful set of photos you took! (I am back and finally have time to enjoy all the posts on your linkup. . .while I do love travel it does cut into the writing and reading time  )!! I can’t imagine the amount of work to do something like this, amazing and it is flawless! Hi Nancie, Oh wow, what a unique, beautiful and amazing Buddha! I’ve not seen a woven one and didn’t even know that such one existed. i can’t believe the details and very fine craftmanship. It must be woven with a great amount of love and devotion. I’m completely in awe. Thanks for sharing. I’ve never seen a bamboo woven Buddha before. Wow, that is just beautiful and I love the attention to detail. That is just a lot of work, patience and dedication.Definitely a labor of love. Do they have the lady’s name for credit next to the Buddha? Very impressive. I never imagined that such a large and detailed work of art could made of woven bamboo. That craftsmanship is simply amazing. I have never heard of a bamboo buddha. In the photo from afar, it looks almost like a textured wood carving. She is very talented. I once tried to weave a basket out of palm leaves and was atrocious at it, so I appreciate her abilities that much more. Patience. Yep, that would be the necessary skill for such an enormous endeavor. I can’t even imagine! How very unique to take a simple reed like bamboo and make something so huge and endearing. It’s obviously made with immense love. What a cool woven statue. I really hope to get back to Thailand someday soon. I loved everything I did and saw while I was there and after reading your posts, I always see so much more! Thanks for sharing this, Nancie! What a work of art we have in that Buddha! Would love to see that in person. Love the grand perspective on the Bamboo Buddha,Nancie. Simply breathtaking; a true work of art…the artist and the village have a lot to be proud of!